Dates of the New Moon and Full Moon for every month of the year 2017, based on the location of London (UK) at the time of midnight. Also the Star Sign or Zodiac sign the Full Moon / New Moon will be in. 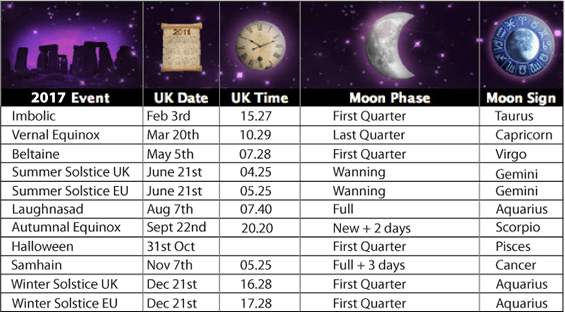 Below is a table that shows the Solstice or Equinox event of the year, also shown is the phase of the Moon at that time, and the Star Sign or Zodiac Sign the Moon will be in. The moon on that day will be in zodiac sign Capricorn at 23.30 south latitude. The phase of the moon will be a Waxing Crescent. The New moon will occur on Dec 18th at 06.31 GMT. This is the best time of the month to observe faint objects such as galaxies and star clusters because there is no moonlight to interfere. The Ursids is a minor meteor shower producing only about 5-10 meteors an hour. The shower runs annually from Dec 17th – 23rd it peaks this year on the night of the 23rd. Of course the moon is known to affect the tides and through its gravitational pull. It may not be surprising then that the moon is related to water in esoteric traditions and that water is the esoteric element for emotions. Our bodies are largely comprised of water too. So the inference is that moon affects our emotional own tides; as our whims rise and fall. In other words our emotions and relationships are the personification of Gravitational forces. 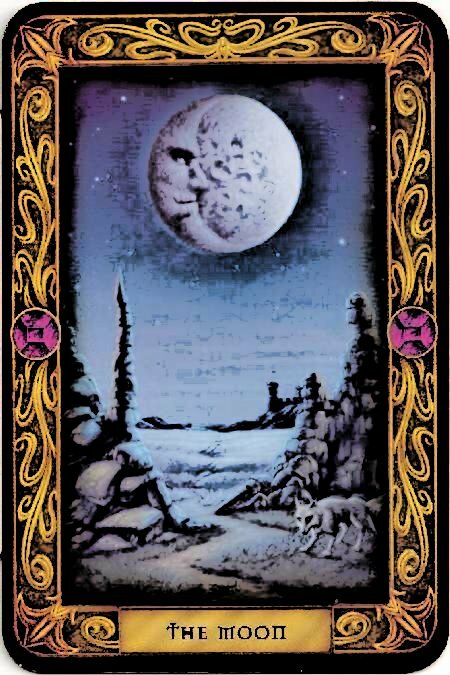 The Moon Tarot card represents the strange attractions that we have, our undercurrents that dictate our directions, often of course these are in contrast to our outward personas. The moon can show us what is driving us. 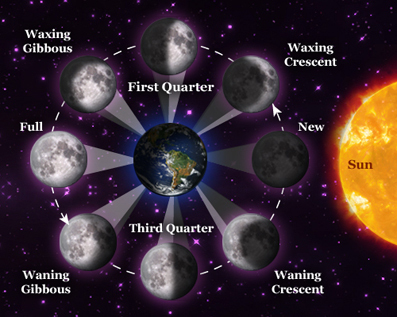 The moon moves through a cycle of phases from the New Moon to the first quarter, full moon, last quarter and new moon again. 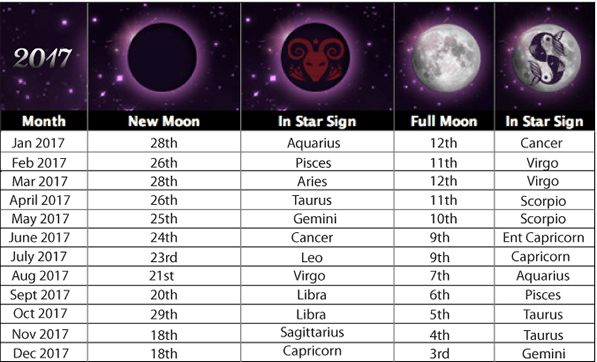 The new moon is the end of one cycle and the start of another, the full moon is the peak of the cycle and as the peak its purpose or effect is most visible at that time. Each Cycle carries the effects of the sun, its sunlight and electromagnetic force (via Moon to Earth) to have a specific effect on our emotions and how we relate to our world; our magnetic ties. In this relationship the moon also serves to provide us with a pathway to controlling the effects of what we are bound to, and what we can release from our bonds. 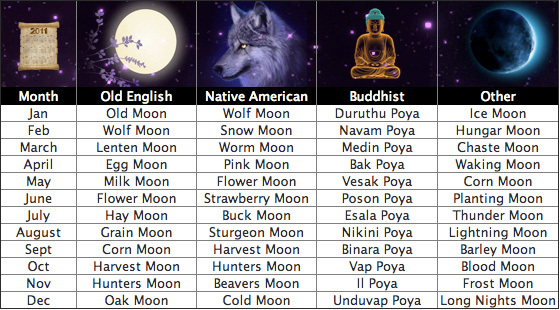 – Please Research Moon Rituals – One we have included below. Moonlight carries a smaller spectrum of light than the sun. 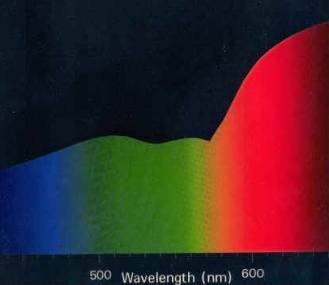 Light in the visual sense includes three primary colour bands RGB, Red Green and Blue. Moonlight being reflected light, loses a range of colour and so does all reflected light. Moon light has been measured in terms of its colour wavelength, and is absence of one colour band and vastly reduced in another, making it mostly in the Blue Spectrum. In most magical and mystics circles blue is regarded as colour of spiritual communication and expression, where as the red spectrum is associated to the physical existence, and Green is associated to Earth bound Love and growth. The absence of the red spectrum of light allows us to attach our red spectrum to the moonlight to reform the white light, of course this can only be done if all three prime colours are formed, Red, Blue and Green and so any such working must be done with a good heart, a spiritual intention and material energy. Prior to Beginning write with zeal, passion and purpose, on paper the intention of what you want to release; addiction, attitude from your life. To Begin cleanse your sacred area with an opening prayer, a sage smudging, and/or by burning some incense. Invite your guides, angels, masters, or teachers to be at your side throughout the ceremony. Point a lit smudge stick to the sky, then full the smoke to the ground at your feet and begin to circle anti clock wise with the smudge, making a spiral of smoke that starts tight and small and grows in size as it moves upwards. In this action we are creating a lifting vortex of energy to release into. The smudge stick will loosen the air around and within you. Light one or more candles. These will remove the light. Look to the skies. Breathe in the moon light and moon ignited night air, breath this air down to your feet and allow it to loosen all of the atoms within all of your being. Read out loud the words you have written on the paper. Set your intention to release the item/addiction/attitude from your life. As you speak the words, expel the air inside you as if want you need to release is in your mouth, make your actions in tune with your command to release. Once announced, set the paper to fire, and watch the embers rise as smoke and leave. As you watch the smoke leave, and having felt the commitment of your action, concern yourself no more, do not re-think, do not re-consider, KNOW, that is done and the universe will now respond. The next action is to employ faith, in what you have done, and in what the universe will do.